With lessthan 60 days until Darwin's SKYCITY Triple Crown event, it has been confirmedTeam Bray Racing will be part of the official on-track entertainment,delivering their signature smoky burnouts to the delight of V8 Supercar fans. TBR'sVictor and Ben Bray have previously been a 'must-see' part of the entertainmentprogram at many V8 Supercars events around the country, with theirrubber-burning performances earning them a solid reputation amongst race-goers. Now TBR isdelighted to confirm that with the help of SKYCITY Triple Crown event promoterNorthern Territory Major Events, both Victor and Ben are set to deliver theirsignature thrills to race fans at Hidden Valley Raceway across June 14 to 16. "Wehave had some fantastic times at V8 Supercar events around the country and weknow the fans absolutely love what we do with our burnout cars, so I amabsolutely stoked to be officially signed up for the Hidden Valley Racewayevent this June," Victor said. "Ithas been two years since we smoked them up at Hidden Valley, so I am reallylooking forward to getting back to the track and putting on a good show for thefans." Eventpromoter and Northern Territory Major Events General Manager Paul Cattermolesaid he couldn't wait to welcome the Brays back to the Northern Territory. "Victorand I have known each other for many years and I can tell you – there is noneed to sell the name Victor Bray in the Northern Territory, he is very wellknown here. I know the fans are going to come out in droves to see him and Ben inaction each day of the SKYCITY Triple Crown," Cattermole said. 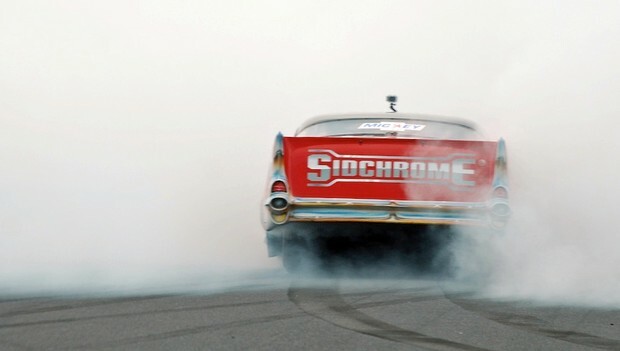 Victor andBen Bray will be on track in their Sidchrome burnout cars for each day of theSKYCITY Triple Crown at the Northern Territory's Hidden Valley Raceway acrossFriday June 14 to Sunday June 16, 2013.